Gnocchi is one of my favorite dishes and it’s so difficult to get right. At Regal they make their gnocchi with sweet potatoes, giving it just a hint of sweetness that nicely balanced out the slight acidity of the marinara sauce. Probably to balance out all of the carby goodness we were enjoying, the chef sent out some crisp cool green bean salad. But this isn’t your grandmother’s green bean salad. 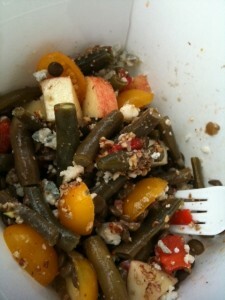 Interestingly enough the other ingredients in the mix were apples, blue cheese, tomatoes, and lentils. Yes, lentils. I wasn’t sure how it would all play together but it was really good. The mix of textures worked well together and the flavors were well balanced. Before the day was out we tried most of their other pastas and sauced and there wasn’t a disappointing one among the bunch. I think the green chile and turnip green ravioli is still my favorite simply because it is so unexpected. 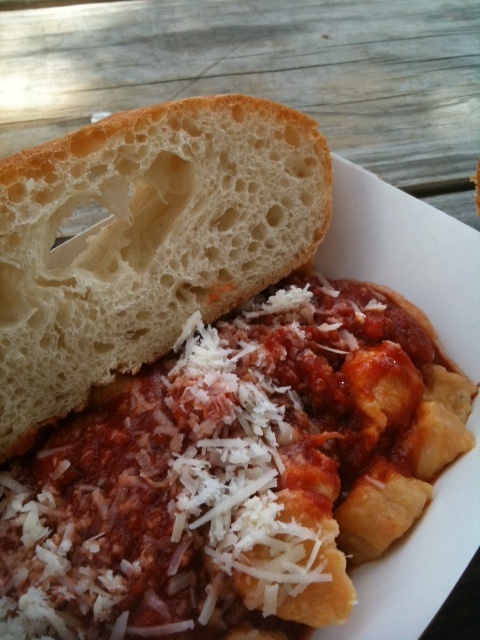 But for a more traditional take on stuffed pasta the cheese ravioli with meat sauce can’t be beat. If you haven’t found your way to Regal Ravioli I’d highly recommend you add it to your “to try” list, particularly now that the weather is cooler and a good batch of pasta will warm the heart as well as the stomach.